During the ÒCuban Missile CrisesÓ, October 1962 the Caloosahatchee performed the duties of refueling the blockade fleet off the cost of Cuba. On 8 May 1968 Caloosahatchee returned to Bethleham Steel Corporation at the Key Highway Shipyard, Baltimore, Maryland where she was delivered to the custody of the Commandant FIFTH Naval District and the Supervisor of Ship?Building for conversion and modernization. 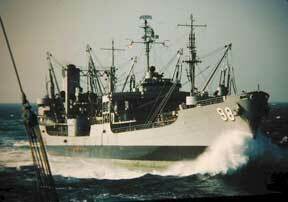 Caloosahatchee was re-commissioned as mini-multi-commodity replenishment ship on 27 September 1969 and assigned to Service Squadron TWO, then homeported in Newport, Rhode Island. Since rejoining the Atlantic Fleer following conversion, Caloosahatchee has established an enviable record of operational performance and material reliability. In December 1969 she was awarded the highest operational readiness inspection grade assigned by the Commander Training Command, U.S. Atlantic Fleet during the calendar year 1969. During September, 1970 the Caloosahatchee while in the eastern Mediterranean Sea participated in the naval blockade off the coast of Lebanon & Jordan during ÔThe Jordanian CrisesÓ when members of the PLO seized control of three jetliners which were later blown up on the ground in Jordan after the passengers (including some Americans) and crew were evacuated and held as hostages.Ê The Caloosahatchee supported units of the SIXTHFLEET from September 1969 to February 1971 and was awarded the Battle Efficiency ÒEÓ, and the Engineering Excellence ÒEÓ in 1973. In February 1975 Caloosahatchee was reassigned to her present homeport, Norfolk, Virginia, coincidently transferring allegiance to Service Squadron FOUR. She departed for the Mediterranean via the North Atlantic, North Sea, and Baltic Sea Areas. Complimented for her overall material condition and cleanliness for a vessel her age by the INSURV Board in March 1977, Caloosahatchee then commenced a major RAV, which she completed two weeks early, a first in the Surface Force community over a considerable span of time. Following a brief period of refresher training and WESTLANT support operations, Caloosahatchee again departed for the Mediterranean to spend the winter of 77-78 operating with units of the SIXTH FLEET. Combat Information Center Green ÒEÓ, Communications Green ÒCÓ, Gunnery Systems ÒEÓ, Damage Control ÒDCÓ, and the Deck Seamanship Award. Following overhaul and after refresher training in August 1979, Caloosahatchee in September departed with Commander SECOND FLEET for Northern Europe and NATO Exercises to be conducted in the North Atlantic, North Sea, and Baltic Sea areas. Caloosahatchee sustained her enviable record of operational performance and material reliability by replenishing 116 ships and meeting all commitments. During 1980 the Caloosahatchee participated in various readiness exercises, which involved two deployments to Cuba and a five-month cruise to the Mediterranean. Over 170 safe replenishments were completed in 1980, which set a new record for the CALOOS and established a precedent difficult to follow. 1981 brought the CALOOS another fast paced Caribbean deployment and a six-month cruise to the Mediterranean. The CaloosahatcheeÕs reputation continued to shine as she serviced the fleet with pride and professionalism. The Caloosahatchee was decommissioned on February 28, 1990 at Norfolk, VA after 45 years of ÒSERVICE TO THE FLEET WITH PRIDEÓ. She was towed to the Mothball fleet on the James River where she sat until 2003 when she was sold for scrap to a salvage company in England. On October 6th the Caloosahatchee was taken under tow by an Ocean-going tug along with her sister ship Canisteo (ex AO-99) for a 4,500 mile / 21 day trip across the Atlantic to the Able UKÕs Graythorp yard, near Hartlepool, England. When the ships arrived there was protesting against the scraping of the ships in England due to the oil, asbestos, and PCB contamination aboard both ships. As of spring of 2005 the Caloosahatchee and the Canisteo are moored next to each other until the legality of the scraping can be resolved. Even long after the Caloosahatchee has stopped serving the U. S. Fleet she is still making history.